After just one visit to malorieshmyr.com it is obvious that this talented creative director, fine artist and 3D modeler is something special. The last couple of years have brought a world of success for this Edmonton, Alberta-based talent whose whimsical view of the world has been translated in movies, on the runway, on canvas, in print, and in photographs. I have had the honour of knowing Malorie for many years now and have had the pleasure of interviewing her to get some insight into the life and mind of a working artist. Obsessed with staying in the lines as a child, Malorie's professional career as an artist really started with the decision to attend the Academy of Art in San Francisco where she learned how to create 3D models for video games (a skill that she has also used to help develop 3D sets for movies as well). Though there was clearly money in this type of work, she soon realized that her true love was painting, drawing (see sketches from her notebooks below), and creative directing. "I love the idea of using more than one medium to convey ideas," Malorie told me. The Anthrotorian (A): Where does your inspiration come from? Malorie Shmyr (MS): It would be rare to have something not inspire me! It might be something a part of everyday life, or even just a feeling. I am also inspired by great artists like Klimt, Dali, Matisse, Toulouse-Lautrec, and the sketches of Michelangelo. A: What do you hope to accomplish with your art? 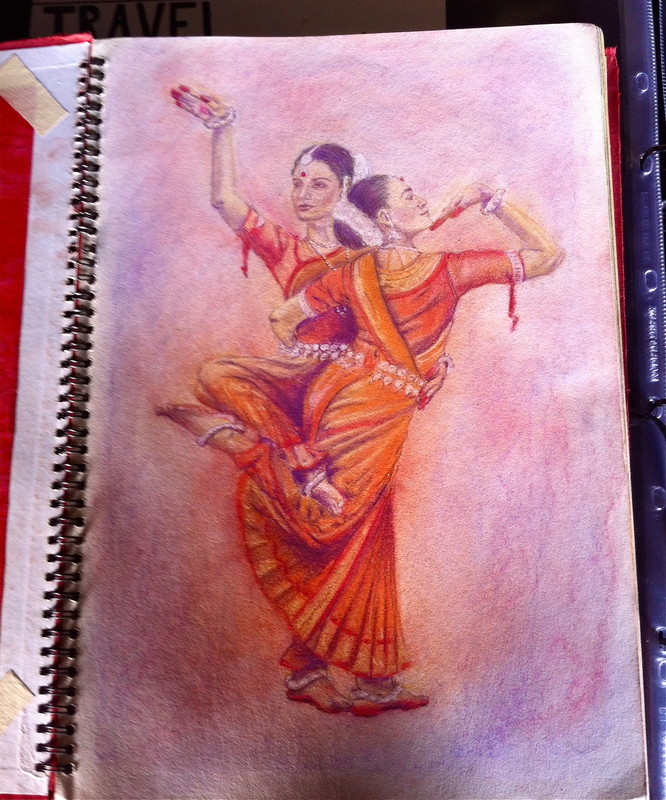 MS: The technical training that I had gave me a need to please an audience with my art. It took me a long time to learn how to create for myself and not with other people in mind. My ultimate hope is to inspire. Even if I don't sell I piece if I inspire someone that's ok.
A: How would you describe yourself in 3 words? MS: Hmmm... inspired, imaginative, excited. Malorie has directed and shot countless photo shoots for local designers, hairstylists, magazines (check out her digital publication Opalus Magazine), and friends (including me!). I was lucky one warm Sunday afternoon to have Malorie shoot some beautiful photographs of me at her studio, and I envy the people that get to work with her on a professional level often. She has never-ending energy, vision, and inspiration when on set that is absolutely contagious! "I used to be really self-conscious about my body. I cried a lot. Recently I saw pictures of myself at, what I considered to be, my worst and really reflected on what it was that I was so worried about. I realized that I wasted a lot of tears. I wished I could tell that girl, 'I wish you could see through my eyes how beautiful you are'." "If I had known that all of the other girls were as self-conscious as me, it would have made growing up much easier." She selected a group of models for the project and had them each tell her what part of their body they were the most self-conscious about. Then using pen and ink, and acrylic on wooden canvases, she is creating a series of images that will represent the evolution from being trapped by your self-consciousness to being free from it. "When you first walk into the gallery... there is going to be a big wood panel covered in different colours of ink that will represent the self-consciousness. There will a mirror, so when you walk in you will see yourself in your outfit, your makeup. I know that a lot of girls, and me, look at what they are most self-conscious about first and then everything else. They will be reminded of their self-conscious before they even come into the exhibit. There will next be small wood panels with figures in black and white in swirls of colour in disturbing, sad poses. They are trapped inside their self-conscious. Restricted. They are not photo-realistic but exaggerated and distorted — how the models see it in their head. Next, these women will be standing in front of their self-consciousness (their colours) open, not covering their bodies, showing their body to us. In poses that are more confident. And then we will go to a large piece that will be many women together and they are all supporting each other, coming together, and not feeling self-conscious together. Being honest with each other to support each other better. It is going to be beautiful and really strong. And then, as you exit, there will be a wood board with a mirror mounted on it but with no colours, the self-consciousness is gone. I will then have the viewers of the exhibit write what they are self-conscious about on the board and once it has been written, it means that you are taking the first step to leave what you are self-conscious about behind you. My hope is then that people who come to the show and go out after will talk about what they wrote on the board and will start a dialogue about our worries and start supporting each other." Meet more inspiring people! Subscribe to The Anthrotorian's Newsletter!